Marrakesh Palace | Where have the days gone? 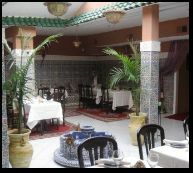 I looked online before leaving home, and made reservations for 7:00 at Marrakesh Palace, on P St NW, only a short walk from Hotel Madera. Dinner was quite tasty. First, there was bread and a variety of olives for the table. Nikki & I each chose a different red Moroccan wine, which unfortunately I can't tell you the names of, but we liked mine better – it was sort of spicier. I had Soup Harira to start, which was a spicy lentil soup, very yummy. Nikki tried the Zaalouk (a chilled roasted eggplant dish), and Alex had Merguez (grilled lamb sausage, which he said was excellent). For dinner, I had Chicken Mkali, which was a sort of stew [tagine] with whole pieces of chicken, preserved lemons, and lots of olives, interesting spices, yum. The others had lamb tagine, lamb stew, and shrimp kabob, all good from the reports. To finish, I had a coffee, which darn it, I can't remember what they called it, but it was like a cappuccino, but not quite. Al & Alex had tea, which was poured with a huge flourish from a gorgeous teapot into pretty tea glasses. I had a dish of very fresh fruit, which seemed to be drizzled with a slightly spicy honey. And according to the receipt, 2 chocolate mousses were eaten, but I don't recall who by or what they looked like [as I'm writing this 2 weeks later]. Some of the other guests even got up and danced a little with her. Totally fun! Though Alex may have been a little embarrassed by so much wiggling right in his face… or wait, maybe that was me that was embarrassed, heh. So anyway, not inexpensive, but highly recommended for a fun and different dining experience! After dinner, we walked back to the hotel, and lounged around for a bit watching the Pitt game, then I drove Alex back to his apartment – got back just in time for the milk and cookies in the lobby! And I was able to make warm milk since there were mugs and microwave in the room! I love this hotel!